Enpass for Linux was updated today with ownCloud/WebDAV sync support, improved search functionality and more. There's also a new Debian/Ubuntu repository for easily installing and updating Enpass. Enpass is a multi-platform password manager which had its first Linux release back in February. The application is available for iOS, Android, Windows Phone, BlackBerry, and for desktops: Windows, Mac and Linux. The desktop apps are free to use with no limitations while the mobile apps offer in-app purchases (Android, iOS) or cost 9.99$ (Windows Phone). While Enpass is not open source software, it uses SQLCipher, an open source extension to SQLite that provides transparent 256-bit AES encryption of database files. For more information please see our previous Enpass article. 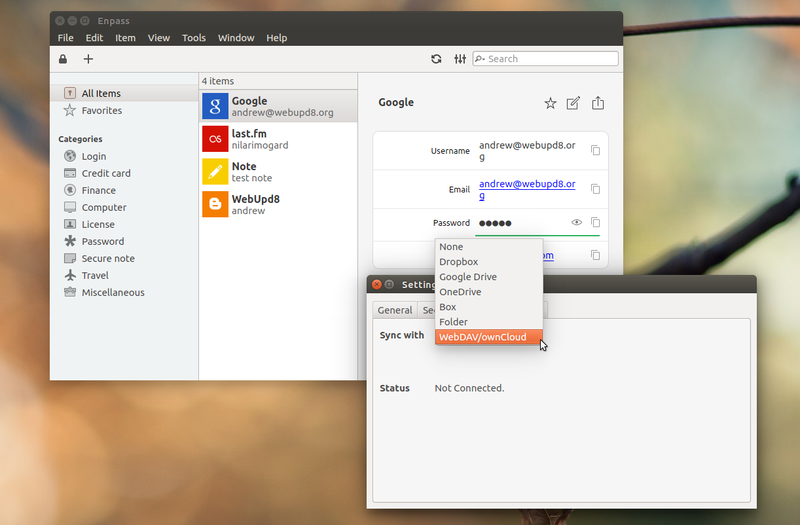 The latest Enpass for Linux brings two highly demanded improvements: ownCloud/WebDAV sync support (the app could already sync to Dropbox, Google Drive, OneDrive, Box or a folder, for use with other apps) as well as a Debian/Ubuntu repository which you can use to easily install the app and receive automatic updates. Also, while Enpass is only available for 64bit on Linux, the newly released repository provides both 32bit and 64bit packages.